Hosting a dinner party includes learning how to arrange the plates, glasses and silverware on the table correctly. Arranging these items according to American-style etiquette will ensure that each guest has enough room to use her utensils appropriately and that the setup will be especially appealing and impressive for those you've invited to dinner. For a formal dinner, the tablecloth should extend between 10 and 15 inches beyond the edge of the table. Place mats are not viewed as "formal" in American table setting, and are appropriate to add to the table for breakfasts, lunch or brunch, or informal dinners. However, place mats made from luxurious materials like silk or linen are fitting for formal dinners; generally, it's best to use either a tablecloth or place mats for the table. There should never be more than three utensils on each side of the plate on an American dining table. During a formal dinner, it may be necessary to present guests with additional utensils for cutting meat, shelling seafood or enjoying dessert. However, these should be distributed when the courses requiring special dining tools are served. 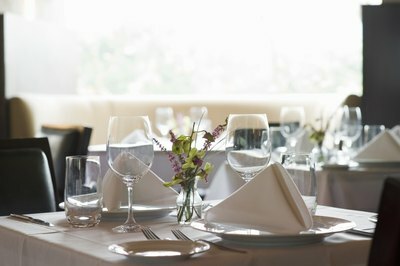 Utensils for the appetizers and first courses should be placed furthest from the plate, so that guests will have to "work in" to use subsequent utensils for additional courses and dessert. Silverware for an American table setting is arranged with the forks on the left of the plate; knives and spoons are on the right of the plate. Both the salad and entrée fork are standard for American table settings; moving from the left of the plate, the entrée fork is placed furthest from the plate and the salad fork is closest to the dinner plate. If there is a fish fork, it is placed furthest away from the plate, so that the entrée fork is in between the fish and salad forks. From the right of the plate, the soup spoon is located furthest right and the dessert spoon is placed on the left side of the soup spoon, closer to the plate. Knives are positioned before the spoons on the right side of the plate; meat-cutting knives are positioned directly next to the plate, the fish or seafood knife to the right of the meat knife and butter knives to the right of the seafood knife. If there is a dessert fork and knife, these utensils should be positioned directly above the entrée plate, with the fork closest to the plate and the knife right above it; the dessert utensils belong to the left of the glasses. Entree plates are positioned directly in front of each seat at the table. Smaller plates for the bread or salad are placed on the left side of the entree plate. In this case, the butter knife should rest across the bread plate, with the knife's handle pointing to the right. Beverage glasses should be set to the right of the entree plate. If wine and water are served at the meal, the wine glass should be placed precisely above the butter knife. Cups for coffee or tea belong on the main plate's right side as well; if there isn't adequate space, the cups for hot beverages can go above the place setting on the right side. Cloth napkins are appropriate for a formal dinner. 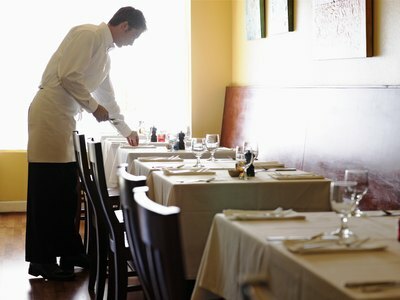 The napkin can be draped across the entrée plate and removed by the guest before the main course is served; alternatively, it can be set on the left side of the forks. Once all guests are seated at the table, it is proper etiquette to unfold the napkin and place it on one's lap before eating.